The Log Connection is a proud member of the International Log Builders' Association. The ILBA is a worldwide organization dedicated to furthering the craft of handcrafted log building, to the advancement of log builders, and to the promotion of the highest standards of their trade. The voice of downtown Penticton, bringing together residents, merchants, businesses, not-for-profit social service agences, arts and cultural groups, governments, educational institutions and other organizations. BC Wood is a not-for-profit trade association that has represented British Columbia's value-added wood products industry for over 20 years. Independent, third party wood products inspection, testing, and consulting company. Thank you for visiting the The Log Connection website www.TheLogConnection.com. The Log Connection is a leading producer of quality hand crafted log homes, log cabins, custom log homes, and post and beam style log homes. 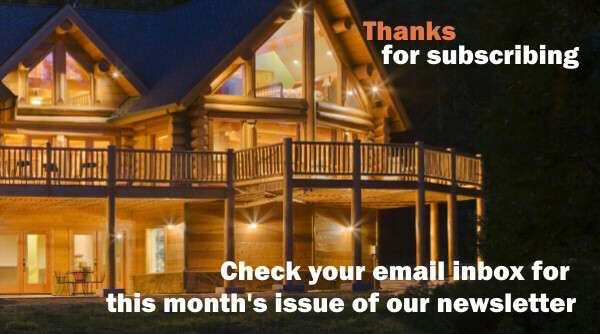 Our monthly newsletter contains a brief article on our Featured Home, as well as information and links to websites relevant to log home design and construction. We plan to introduce many new log home plans in the near future, and our newsletter is your guarantee of being notified as soon as they become available on our web site. Plus, we plan to offer frequent special price offers, such as discounts on a particular log shell package ordered during that month. 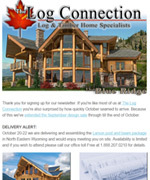 Also, you can request to be notified of any special events such as new log homes being set up in your particular area.